The design is courtesy of Bridget (Bake at 350) by way of her book, Decorating Cookies. I am really enjoying the book which is quite user-friendly. This is the second cookie I've made from it and I LOVE how they turned out! Here's the first cookie, if you're interested. He's a rather cute and cuddly robot, don't ya think? And as it states up above, he's programmed for love. Since the robots are made up of squares and rectangles mostly, it was easy to put them onto the cookies...I made a template on a piece of paper (according to the size of my rectangle cutter), cut it out, placed it on each sugar cookie and traced around it with an Americolor edible marker. I was then able to easily outline/fill the cookies with royal icing. I had so much fun watching these robots take shape, and I hope my little guys love them as much as I do! Perhaps your own little (or big) Valentines will enjoy them too! Those could not be any cuter! I always love projects that boys will like too! hee hee, these are adorable!!! Can't wait to show them to my girls in the morning. They will love them! 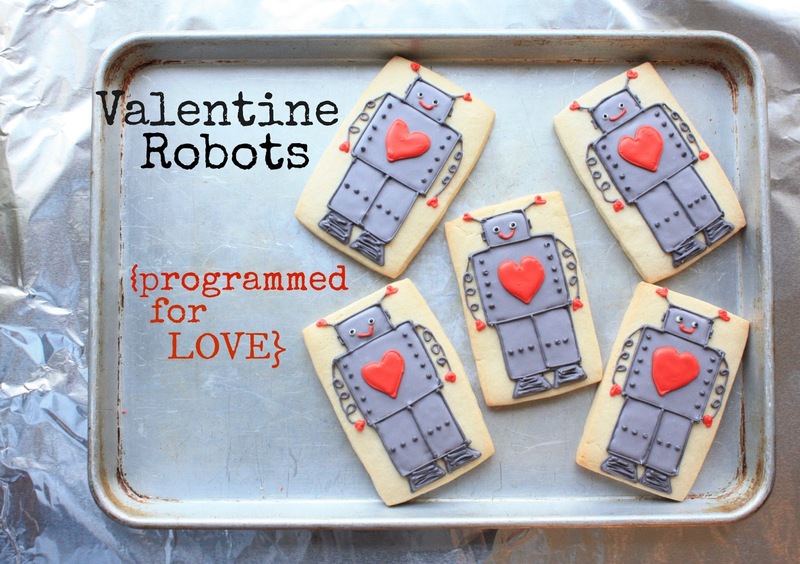 They are perfect Valentine's cookies for boys, soooo cute! I just got Bridget's book for my birthday and it's so inspiring. By the way, you do not look old enough to have 8 grandchildren! Ahhh my boys would love these!! Oh, Sue! I just love those robots!!! I love that you made them on the rectangles, too! So smart! you really don't need an intricate cutter for those! These are so cute. I don't see a pin button ~ did I overlook it? Saw you at the Kitchen Fun link party. Have a great day. These look so cute! I need to practice my piping skills! These are darling! So cute and clever. i'm sure your munchkins loved these, mine would too! you are quite the cookie maker sue! Aawww, so cute, Sue. Love 'em! By the way, you're not the only one who has trouble with those Pin It buttons. If you ask me, they are temperamental! p.s. i pretty much pin your entire blog. Just as cute as can be - programmed for love - PERFECT! wow Sue, where did you get all these fancy and pretty ideas of making cookies!! These are amazing! Mom, they're so stinkin' cute!!! Zeke (and Max) will love them! "Programmed for Love"... I LOVE IT!!! Happy Valentine's Day, sweet girl!